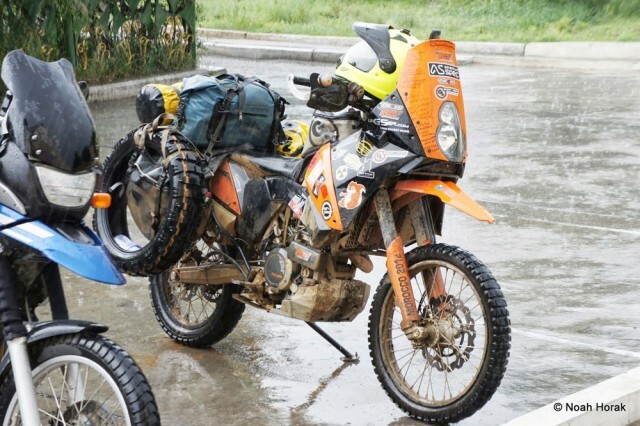 In the spring of 2012, Noah Horak loaded up his KTM 690 Enduro R and set out to ride around the world. 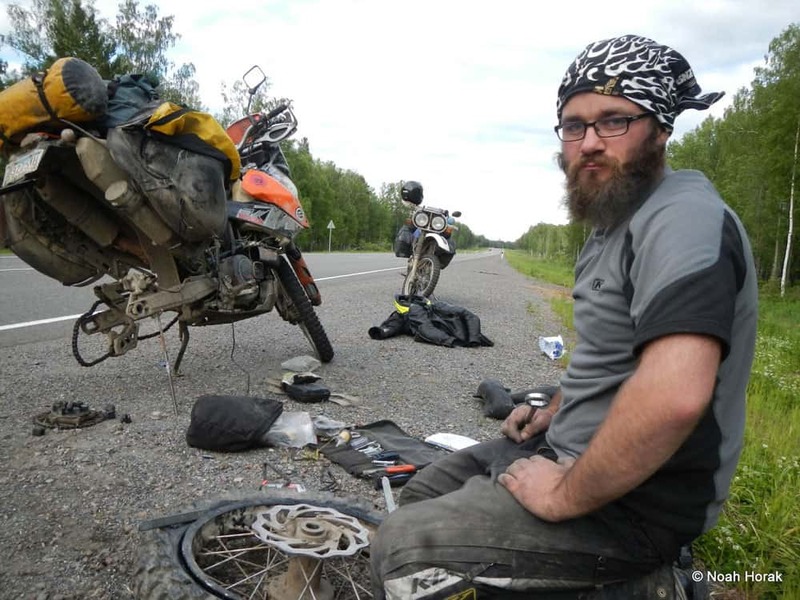 His adventures from Alaska, Morocco, Siberia, and now Asia are a fascinating read. 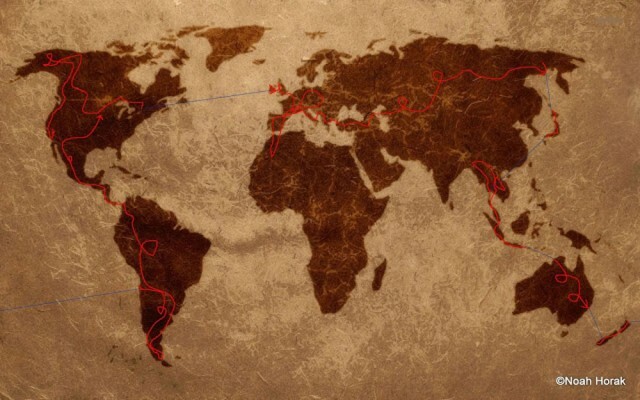 For those with the ambition to embark on a RTW trip, this is what it looks like. This is the real deal. I had the chance to catch up with Noah during the first portion of his travels through Southeast Asia. I bet it feels good to be back on your KTM. You clearly have a close relationship with your motorcycle. Did you think your journey would end before it really got started when it was stolen in Europe? I will be glad to get back to my girl. I have a new regulator rectifier and a new stator for her. As well as a new 4x 10w LED light bar from Baja Design. They make some amazing LED lights. I’m excited to have a “get out of my lane” flasher for Southeast Asia. Riding here on a big bike is kinda crazy. Oncoming traffic treats you like a scooter even though you are easily the fastest vehicle on the road because of the suspension. When my bike was stolen, I only thought for a few hours about quitting my trip. I slept horribly that night. Then, the next morning I had 30 or 40 emails from around the world from people telling me I can’t stop. I was overwhelmed by the support from everyone. 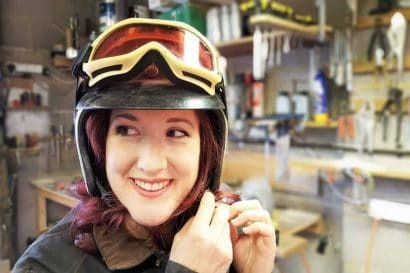 Not just the Irish or the motorcycle community––everyone. I knew then I would continue. I was contacted by someone with a WR250, someone else with an old but great XT600, and I even sent an email to Jenny Morgan about her Tenere 660 rally bike. The 660 rally bike was unfortunately already sold. 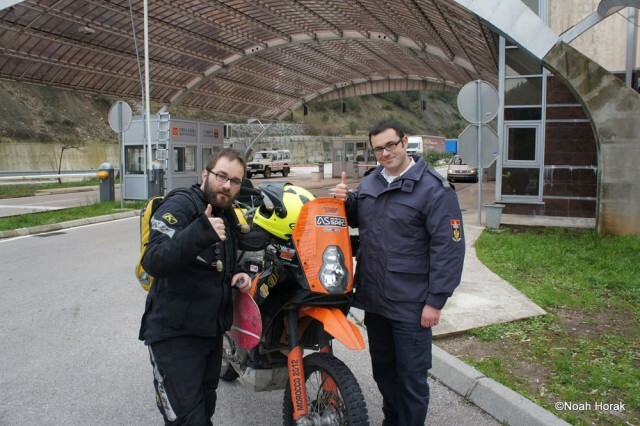 Then I heard about a well traveled 2008 KTM 690 sitting in the UK with Michigan plates. The owner didn’t want to ship it back to the US, so it was a no bainer. My brother switched the title and 2 days later, I had new MN plates. The bike had 25,000 km when I got her. She now has 92,000 km and still has the original piston. I watched the video you shot of your ride along what I think was the Road of Bones. That looked like an incredible leg of your trip if not scary as hell. Was that the most challenging portion of your ride thus far? 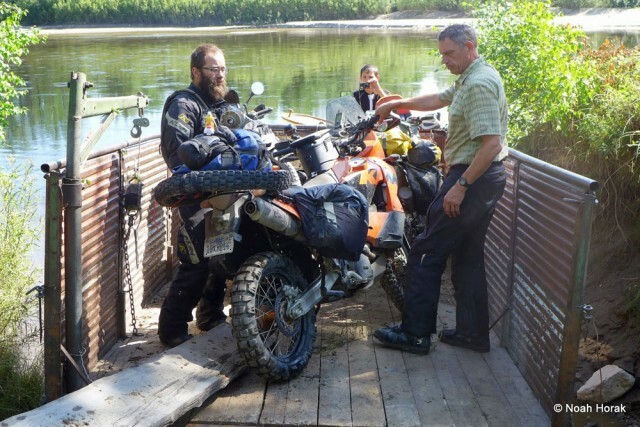 Unfortunately the rain in Siberia kept us from riding the Road of Bones to Magadan. This August in Siberia was one of the wettest on record. The road you are referring to is the “BAM” road. The “Western” Bam runs parallel to the BAM railroad from the top of lake Baikal to Tynda. That is the route we took. 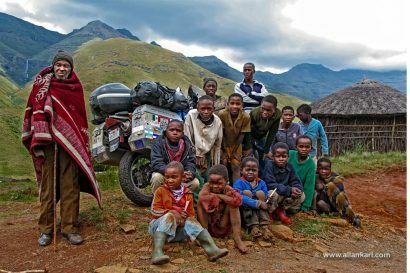 It was 1800 km of hard riding in a region with little to no infrastructure. The only lifeline to these towns is the railroad. It is one of the most memorable places I have been, and I will return. The bridges were scary, especially those spanning the Vitim river. It is 570m long and just as wide as a railroad tie. Since it was built 30 years ago, the wood is rotting and some of the ties are broken. When we walked the bridge, someone had built a fire on it and burned about 4 of the ties. Luckily for us, there was a pile of new ties at the start of the bridge about 30 meters from the damaged area. We fixed the bridge then drank tea with some locals to calm our nerves. The bridge seems to last forever when you ride it, but the exhilaration of reaching the end is crazy. This is only 1/2 way on the BAM road, though. There are many more shorter and sketchier bridges that are even more technical on the way. 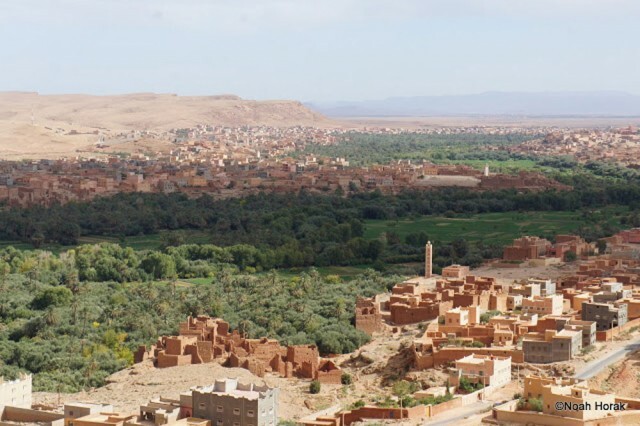 It’s hard for many of us to wrap our heads around traveling for months on end. What does a typical week look like, or is the point not to have a typical week? Does it ever get monotonous? A typical week? I usually try to have an idea where I would like to be in a few weeks time. I don’t really plan my route. I love to wing it. I was definitely feeling things were monotonous in Japan. It is a beautiful country, but I had just been through Siberia, a wild, dangerous and crazy place. A real adventure. Japan is traveling for beginners. It’s too cute, clean and safe for me. I spent a few weeks with my family over the holidays and now i’m feeling really good about Southeast Asia. I also like a slower pace of travel. Although from May 1 to Sept 9, I put on over 30,000 km in central Asia and Russia. When I like a place I stay for longer. Sometimes overnight turns into over a week, and I make many good friends in an area. Judging by your many incredible photos, you travel light. Clearly there is an advantage to not traveling with 75 pounds of gear. Is that a means of improving the ride of the bike, or just making travel easier with less stuff to manage? All of the above. All my gear is designed for backpacking to save weight for important stuff like spare parts. I had a rear wheel bearing go out in Russia, but it was not a problem because I carry them as spares. If you cannot pickup your motorcycle by yourself with all your gear, it is not an adventure motorcycle. My bike with gear weighs the same as a Tenere 660 and much less than a BMW GSA. There is a crazy idea that you need a big motorcycle to go on an adventure. The most incredible places I have been were a blast to ride because I knew the bike could take it and I don’t struggle with unnecessary weight. Any favorite places you’ve seen? Places you wished you had avoided? I loved the Yukon and Alaska. That was the start of my trip. On the Campbell highway in the Yukon, there is a sign I snapped a photo of, “No services for 340 km”. I broke my chain the next morning. For 2 hours I was trying to drive the pin out of my new chain to shorten it to length. I was not carrying a chain breaker and I had not shortened the chain prior. For those 2 hours, not a car, bus, moto or person passed by. That was the moment when I know I was on my own. The Ligerian border road in norther Italy is a hidden offroad gem. I was lucky enough to meet a German kid who said it would be his dream ride. So I decided to do it ,and I don’t regret it. 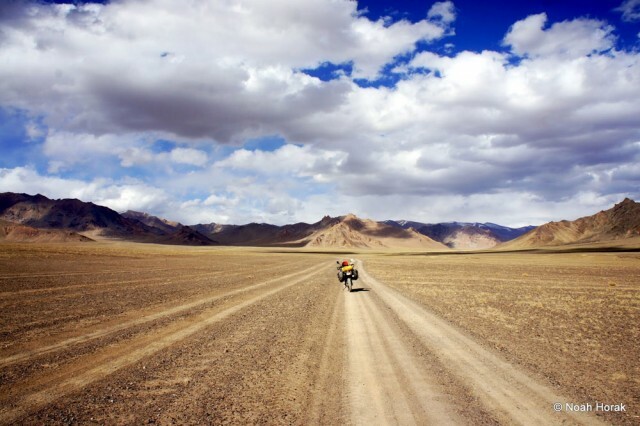 The Pamir Highway in Tajikistan was just amazing along with most of central Asia, Russia and Mongolia. This part of the world is so unknown and even feared by Americans. 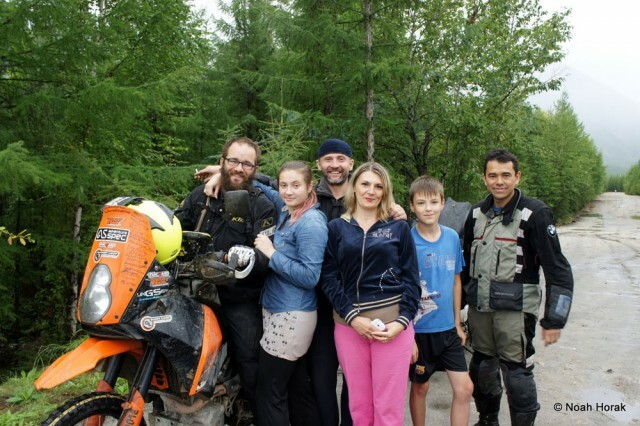 I don’t know why I was nervous about going into Russia, but the motorcycle community in Russia is so great. If you are on 2 wheels, you are a brother. A bed, food and of course Vodka is cheap or free. American does not have this sort of brotherhood for bikers. Finally, my standard question, although not real creative: What parting advice would you give to the would-be world rider? Smaller is better. The adventure starts when the pavement ends. Soft bags are better offroad and they will not break your leg if you go down hard. Only bring necessities. You can buy stuff on the way if you need it. When you leave home for the first time, you will think you don’t have enough stuff. After the first few weeks, you will start sending packages home because you don’t in fact need much stuff. Learn your moto. Love your moto. Take care of her and she will take care of you. I often sit and look at my bike while I’m drinking my coffee. It is amazing how many times I find a loose bolt or a wire that is getting close to the exhaust. Little things that will keep her happy. Don’t let a setback or detour ruin your experience. I look back at my time in Ireland and I smile because of the love I received. Would I have rather my bike not have been stolen? Of course, but from that horrible time sprouted an incredible experience I can’t even put into words. To follow Noah on his incredible journey visit his blog HERE. 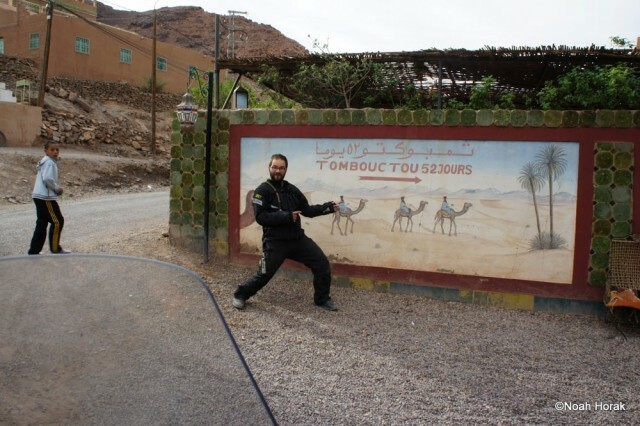 An extensive thread covering his travels can also be found on advrider.com.